Peruvian fisherman peels the skin off the dolphin’s back and cuts the severed body into thin slices. Tails are being chopped up for soup? Exclusive video shared with NBC News provides graphic new evidence that Peruvian fishermen regularly slaughter dolphins for use as shark bait, an illegal practice that, according to activists, kills up to 15,000 dolphins a year. In a risky undercover operation in 2013, Peruvian conservation group Mundo Azul documented shark fishermen harpooning dolphins, hoisting them on board and slicing them up — sometimes while still alive. The fishermen use the meat to lure sharks, which they sell on the Asian market, the group says. Stefan Austermühle, executive director of Mundo Azul, said he wept when he saw photots of the slaughtered dolphins. “And I can tell you that has not happened to me before,” said Austermühle, who has worked on dolphin conservation for 30 years. 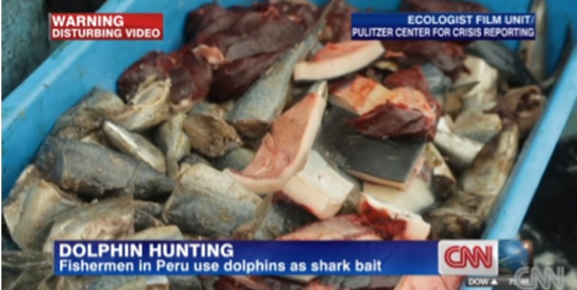 Biologists monitoring Peruvian fishermen also documented them using dolphins for shark bait in a 2010 study. Unlike Japan, where the government permits a specified number to be hunted each year, Peru made killing dolphins a crime punishable by up to three years in prison — but scientists and advocates say the law is poorly enforced. Austermühle says the easiest way to curtail the slaughter, which is carried out small, unregistered boats miles out at sea, is to ban the special harpoon used to spear dolphins alongside the boat. The Peruvian Ministry of Production said in statement that since 2013 it “has implemented various controls to safeguard legally protected species whose hunting is punishable by law,” including confiscating dolphin meat sold in markets. Lawmakers are discussing amendments to the 1996 dolphin protection law that would prohibit the use of dolphins for bait fishing, prohibit the use of harpoons, and potentially allow the hunting of dolphins to be punished by up to four years in prison, the ministry said. Shark fin soup is considered a delicacy in many Asian cultures, and even though the soup is flavourless with a slithery texture, dining on shark fin soup is considered a status symbol. The soup, brewed from dried shark fins, is often served at lush banquets to celebrate weddings, anniversaries and corporate and state events. But in order to meet the growing demand, the fins are harvested around the world in growing numbers. Up to 73 million sharks die a slow death every year because of fining: the inhumane practice of chopping off the shark’s fins and throwing its body back into the sea. The sharks drown, starve to death, or are eaten alive by other fish. And soaring demand for the soup over the past two decades has threatened shark populations globally. To make matters worse, thousands of dolphins are being slaughtered off the coast of Peru, where the mammals are used as shark bait for shark fin soup. The London-based Ecologist Film Unit recently recorded one of the dolphin hunts in an undercover investigation, which details how bleeding dolphins are hauled on the deck of the vessel. A Peruvian fisherman then peels the skin off the dolphin’s back and cuts the severed body into thin slices. “In recent years, there’s been an upsurge in the targeting of sharks. The shark meat is predominantly consumed within Peru, but the fins we’re told are being exported to the Far East for use as shark fin soup,” said Jim Wickens, an investigative journalist with the Ecologist Film Unit. He witnessed the scene along with cameraman Alexander Reynoso who recorded the harpooning of the dolphins. According to the fisherman, the cost of fish bait in Peru has also gone up yearly. It seems to be part of the story around the world, Wickens said. Fewer fish in the sea means it costs more money to buy them. CNN notes that since the video has been released, Wickens has been contacted by experts in Southeast Asia who’ve told him this practice might also be taking place close to Indonesian waters as well. He said it’s hard to know how many dolphins are being killed worldwide because it happens out of sight.